CID Investigations is an expansion of our highly successful Spanish Detective Agency. Our vision is to offer a professional and discrete service to all our clients, whether they be from the private or public sector, at an affordable price. 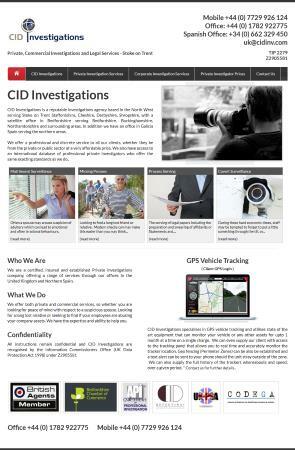 CID Investigations offers both private and commercial services. CID Investigations has the expertise and ability to help you. With a UK base in Staffordshire CID Investigations operates across Staffordshire, Cheshire, Shropshire and the surrounding area of North West England.